Malta in autumn is still pretty warm but the weather may be a little unpredictable. Make sure you check the forecast if you don’t want to leave the house in a T-shirt and flip flops and return looking like a wet puppy. The weather can surprise you, but often it doesn’t surprise the weather man – so your best bet is to check out the 5-day forecast. If you want to have a great time at the weekend, you will need to plan both indoor and outdoor outings and just go where the 5-day weather forecast permits. Here are some ideas to help you enjoy your autumn, every weekend. Sundays are great for an early one to catch the morning markets. The Birgu market at the three cities is an event that attracts an interesting lot, and that’s not just the stand owners. If you like to pick up cheap antiques, curios or collectibles with a story, this market is for you. You will need to get there a little early to make sure you catch the most interesting stuff, as new items fly off the stands real quick. The market is small but by spending a leisurely couple of hours rummaging through the interesting stands will soon have you working up an appetite that you can easily satisfy at the picturesque Moulin D’or just across the square from the market. If you prefer something a little more upmarket, you can choose from the myriad of restaurants down near the marina, just 5 minutes down the road. A site to visit if you haven’t yet, is St. John’s Co-Cathedral in Valletta. It’s known for housing the amazing paintings of ‘The Beheading of St. John’ and ‘St. Jerome’s Writings’, which were created in Malta by an obsessive Caravaggio, who was himself wanted for murder, a candidate for death by beheading. These are two of the most acclaimed paintings depicted in chiaroscuro, a technique that Caravaggio executed beautifully as a true pioneer. It is definitely worth getting up there to catch a glimpse of these amazing works of art. The Marsaxlokk market is very well known. However, it is far more pleasant in autumn than the rest of the year. Gone are the summer tourist crowds. In autumn, the market is a true pleasure to visit. You can pick up your fresh fish and head home to cook lunch or hang onto it for next week and have a sumptuous lunch at one of the many fish restaurants along the coast. No matter where you eat, the food is traditional and the fish exceptionally fresh. The village of Dingli, on the outskirts of Rabat offers a breathtakingly panoramic view of Malta’s cliff-side. It’s very quiet, with little activity and buildings, except for a small restaurant across the road from the cliff-edge. The Dingli cliffs are a great place to go for a jog with an unusual view or just a leisurely walk to enjoy the sunset. On the cliff road, you can also find the Cliff Interpretation Centre. Entrance is free and you can book a guide for your walk on a ‘pay what it’s worth to you’ basis. Ghar Dalam is a big cave in Birzebbuga where many fossils were found. It provides proof that a number of European animals dwelled in Malta many years ago and some species even became pygmy varieties. The Cave museum contains some fascinating skeletons belonging to dwarf elephants, hippopotami, small mammals and birds. 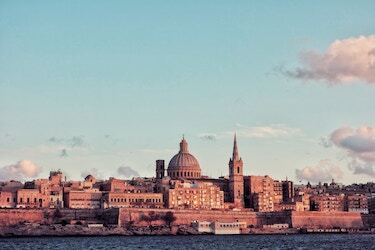 A collection of fossils and artefacts from between 18,000 to 10,000 years ago prove that Malta was once connected to mainland Europe. A UNESCO World Heritage Site, the Tarxien temples are perhaps the least known of the many Neolithic temples dedicated to the goddess in Malta. It is estimated they were built between 3,600 BC and 2,500 BC. Made up of four structures, they are the most highly decorated of all the local megalithic structures. It is also the temple where a colossal statue of a skirted ‘fat lady’ goddess was found. Absolutely a must-see. If you’re into recent history, you can visit Fort St. Elmo and the Aviation Museum in one go. They are right next door to each other on the outskirts of Valletta and are both testimony to Malta’s wartime efforts. The Aviation Museum has a collection of war planes exhibited with their stories. St. Elmo, apart from its historical significance, has also been used in many popular films such as 'Midnight Express'. So, you can go filmset-spotting too. If you’re looking for a cosy indoor location, this is it. With the obligatory toy gift shop and great restaurant, it is a place where you can spend most of the day. Visit the aquarium first; watch and learn about the fish on display and then stay for lunch before heading to the playground if you have a little one or simply take a walk by the sea. San Anton gardens is one of the quietest places you can visit on a Saturday. Small by European proportions but pretty and calming, it’s a perfect place for a walk before heading to the local bar for a pub lunch. San Anton neighbours the village of Lija, which can be reached on foot in just 5 minutes. The area around the church boasts many restaurants, wine bars and pubs ranging from quant and local to a la carte. So, you’re bound to find one you like. All these spots can be reached using GoTo’s point-to-point car sharing service. Just jump in and drive to your destination. Enjoy the day and then book another car when you’re ready to get back. Using the GoTo car sharing service is fast and easy; however, you need to make sure you’re registered and verified as a licenced driver first. So register today and you are good to go.